Chainlink Fencing is used in domestic and industrial applications. 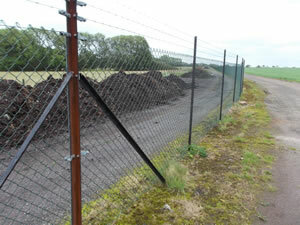 It provides a suitable security barrier when (as displayed) is used in conjunction with rows of Barbed Wire at the top. It comes in varying heights and wire thicknesses and is available in PVC coated or galvanised finish. Chainlink is attached to its posts using line wires and bars that thread through the ends that stretch it along the fence line. Posts are usually steel angle sections in black primer, green painted or galvanised finish. Concrete posts are also popular in lower height domestic fences and government installations. Chainlink fencing also allows a clear line of sight and is often used in older housing developments. WCFS are able to supply most chainlink requirements within just 2-3 days.